First produced by Ka-Bar in 2006, the U.S. Army version of the Vietnam Commemorative Knife is the real thing, with a little added decoration. The 7-inch bowie style blade and stacked leather handle match the well known Ka-Bar fighting knife pattern that has been standard issue for American military since WWII. Even finger guard and pommel are high carbon steel, strong enough to hammer nails and pry up floorboards. This particular knife resembles the weapon issued to ground forces in the Vietnam war -- other versions with modifications more useful to airmen were issued to flight crews and pilots. This model probably will see more shelf display than actual use, since the commemorative art on the 1095 chrome vanadium steel blade is part of the epoxy anti-glare coating and not a permanent engraving. Use of the knife, including even ordinary sharpening, will scar the design. Three versions of the knife, marked either U.S. Army, Navy or U.S.M.C., were issued in the memorial series. 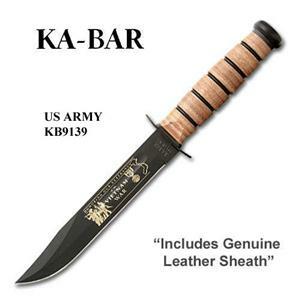 This knife -- the Army version -- has the service branch stamped at the base of the blade along with the usual Ka-Bar mark. Each knife displays the slogan "Honoring Our Veterans of the Vietnam War." Artwork bracketing the phrase was inspired by the Three Servicemen Statue at the Vietnam Memorial in Washington, D.C.; the Vietnam Service Medal; and the current outline map of the formerly divided nation of Vietnam.